Nostalgia time ... probably more for UK members than me, but definitely a trip down memory lane. 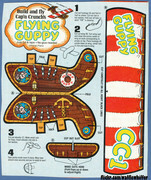 Have you ever come across the line of Cap'n Crunch cereal box ships from about '74 or '75? 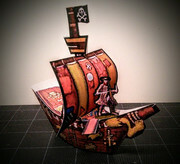 There was a time when they offered cut out ships for both the Cap'n and the Cinnamon Pirate. I used to have naval battles on the kitchen table with them as a child. The Doctor Who ones I remember and were exactly what I had in mind when I did my cybermen. If there was Weetabix with the Dr Who promo, I'd nag my mum to buy them, even if we had the cereal at home. I'd have the box chopped up with in about 10 minutes of getting home! My favorite was the Honey Comb cowboys and Indians with the cut-out fort and wagons. I'd like to see the wagons again and see how they were put together. Cool! It's the cinnamon pirate, I'm going to go print this out right now. When I was a kid my family lived on a sailboat for a few years. We saved cereal boxes (among other things) to make our toys out of. My brother and I had two books one was Schoolastic's paper fun and the other was Schoolastic's paper planes (I think, though it has been over thirty years). I also remember making an ATAT from cut up cereal boxes and toilet paper tubes with paper fasteners (for movable legs). Building my own toys then probably has a lot to do with why I enjoy building them now. I know this isn't quite the same thing, but it made me feel nostalgic anyway. Arr matey! A good day of piracy starts with a healthy breakfast! I blew it up to fit a Silhouette's cutting area (about 7.5x10) then decided it would be cheating to use an automated cutter and used scissors instead. I can't seem to find the Guppy anywhere? Giant space moggy off the port side Cap'n! "My God, Bones... what have I done?" My son used to be a cook at the Red Baron Bar & Grill in Cole Camp, Missouri. So I had to make him a triplane. Just before the Cole Camp Fair, he was let go (as was the head cook and half of the servers). When he asked me if it was okay to burn his Red Baron model on the steps of the bar during the fair, I said 'sure'. It was absolutely hilarious. Even the chief of police was laughing.